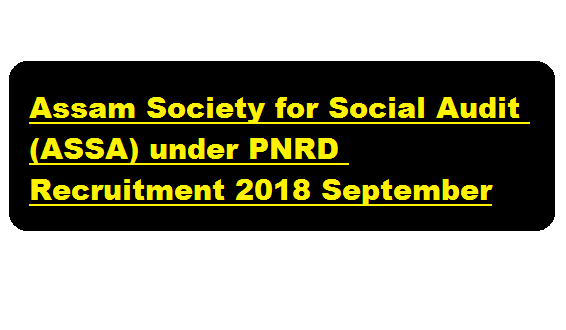 Assam Society for Social Audit (ASSA) under PNRD Recruitment 2018 September | Director Post :- Applications are invited from the intending candidates for post in the Assam Society for Social Audit (ASSA) under Panchayat & Rural Development, Govt. of Assam for engagement on contractual basis. Detail of the post is as follow. The post is purely temporary in nature. Refer to below section for more information regarding the vacancy. In this section, we will discuss in detail about Recruitment of Director Post under Assam Society for Social Audit (ASSA) under PNRD Recruitment 2018 September with all the details and requirement. Minimum Qualification : Candidate must be Post Graduate in Social Science or equivalent. Experience : Must have 10 years of working experience on social audits & rights of the poor. Application to be submitted online only at www.pnrdhcms.org. Scanned documents to be uploaded with online application. The short-listed candidates must appear for an interview and / or written test for which no TA/DA shall be paid. Last date of submission of application is 15/09/2018 at 5.00 p.m.
1. Please visit www.pnrd.assam.gov.in or www.rural.assam.gov.in for detailed advertisement including Job Profiles, eligibility criteria, pay package and other conditions for positions mentioned above. 2. The department reserves the right to cancel any or all position at any stage of the recruitment process. 3. At any stage of recruitment, it is found that candidate does not fulfill the eligibility criteria and / or that he / she has furnished incorrect / false information / certificate / documents or has suppressed any material fact (s), his / her candidature/ appointment will stand cancelled and necessary legal action will be initiated. 4. The decision of the Selection Committee in any matter relating to the recruitment at any stage of the recruitment process will be final and binding upon the candidates. 5. Initially this engagement will be for 10 months. Based on performance and requirement of the mission, contract may further be extended.